In August 2015, more than 150 scientists interested in the exploration of Mars attended a conference at a hotel in Arcadia, California, to evaluate 21 potential landing sites for NASA's next Mars rover, a mission called Mars 2020. The design of that mission will be based on that of the Mars Science Laboratory (MSL), including the sky-crane landing system that helped put the rover, Curiosity, safely on martian soil. Over the course of three days, the scientists heard presentations about the proposed sites and voted on the scientific merit of the locations. In the end, they arrived at a prioritized list of sites that offer the best opportunity for the mission to meet its objectives—including the search for signs of ancient life on the Red Planet and collecting and storing (or "caching") scientifically interesting samples for possible return to Earth. We recently spoke with Ken Farley, the mission's project scientist and the W.M. 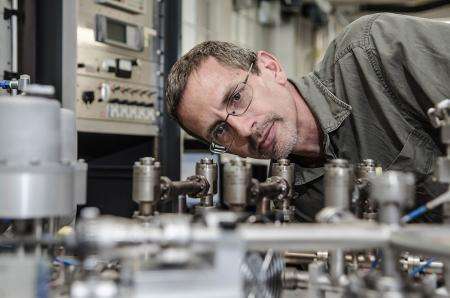 Keck Foundation Professor of Geochemistry at Caltech, to talk about the workshop and how the Mars 2020 landing site selection process is shaping up. Can you tell us a little bit about how these workshops help the project select a landing site? We are using the same basic site selection process that has been used for previous Mars rovers. It involves heavy engagement from the scientific community because there are individual experts on specific sites who are not necessarily on the mission's science team. We put out a call for proposals to suggest specific sites, and respondents presented at the workshop. We provided presenters with a one-page template on which to indicate the characteristics of their landing site—basic facts, like what minerals are present. This became a way to distill a presentation into something that you could evaluate objectively and relatively quickly. When people flashed these rubrics up at the end of their presentations, there was some interesting peer review going on in real time. We went through all 21 sites, talking about what was at each location. In the end, we needed to boil down the input and get a sense of which sites the community was most interested in. So we used a scorecard that tied directly to the mission objectives; there were five criteria, and attendees were able indicate how well they felt each site met each requirement by voting either "low, " "medium, " or "high." Then we tallied up the votes. You mentioned that the criteria on the scorecard were related to the objectives of the mission. What are those objectives? We have four mission objectives. One is to prepare the way for human exploration of Mars. The rover will have a weather station and an instrument that converts atmospheric carbon dioxide into oxygen—it's called the in situ resource utilization (ISRU) payload. This is a way to make oxygen for both human consumption and, even more importantly, for propellant. In terms of the landing site process, this objective was not a driving factor because the ISRU and the weather station don't really care where they go. And the other three objectives? We call the three remaining objectives the "ABC" goals. A is to explore the landing site. That's a basic part of a geologic study—you look around and see what's there and try to understand the geologic processes that made it. The B goal is to explore an "astrobiologically relevant environment," to look for rocks in habitable environments that have the ability to preserve biosignatures— evidence of past or present life—and then to look for biosignatures in those rocks. The phrase that NASA attaches to our mission is "Seeking the Signs of Life." We have a bunch of science instruments on the rover that will help us meet those objectives. Then the C goal is to prepare a returnable cache of samples. The word "returnable" has a technical definition—the cache has to meet a bunch of criteria, and one is that it has to have enough scientific merit to return. Previous studies of what constitutes returnability have suggested we need a number of samples in the mid 30s—we use the number 37. It may seem strange, but there is a reason for this strange number. Thirty-seven is the maximum number of samples that can be packed into a circular honeycomb inside one possible design of the sample return assembly. The huge task for us is to be able to drill that many samples. We've learned from MSL that everything takes a long time. Driving takes a long time, drilling takes a long time. We have a very specific mandate that we have to be capable of collecting 20 samples in the prime mission. Collecting at least 20 samples will motivate what we do in designing the rover. It also has motivated a lot of the discussion of landing sites. You've got to have targets you wish to drill that are close together, and they can't be a long drive from where you land. There also has to be diversity because you don't want 15 copies of the same sample. After all of those factors were considered, what was the outcome of the voting? What came out of it was an ordered list of eight sites. One interesting thing about that list was that the sites were divided roughly equally into two kinds—those that were crater lakes with deltas and those that we would broadly call hydrothermal sites. These are locations that the community believes are most likely to have ancient life in them and preserve the evidence of it. It's easy to understand the deltas because if you look in the terrestrial environment, a delta is an excellent place to look for organic matter. The things that are living in the water above the delta and upstream are washed into the delta when they die. Then mud packs in on top and preserves that material. What is interesting about hydrothermal systems? A hydrothermal system is in some ways very appealing but in some ways risky. These are places where rocks are hot enough to heat water to extremely high temperatures. At hydrothermal vents on Earth's sea floor, you have these strange creatures that are essentially living off chemical energy from inside the planet. And, in fact, the oldest evidence for life on Earth may have been found in hydrothermal settings. The problem is these settings are precarious; when the water gets a little too hot, everything dies. 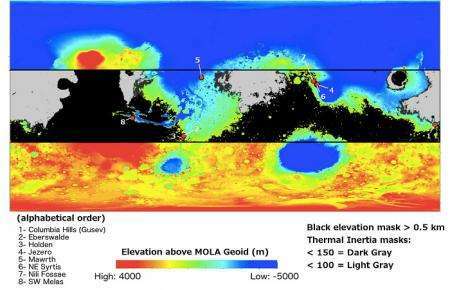 What is the heat source for the hydrothermal sites on Mars? There are two important heat sources—one is impact and the other is volcanic. A whole collection of our top sites are in a region next to a giant impact crater, and when you look at those rocks, they have chemical and mineralogical characteristics that look like hydrothermal alteration. A leading candidate of the volcanic type is a site in Gusev Crater called the Columbia Hills site, which the Spirit rover studied. The rover came across a silica deposit. At the time, scientists didn't really know what it was, but it is now thought that the silica is actually a product of volcanic activity called sinter. The presenter for the site showed pictures from Spirit of these little bits of sinter and then showed pictures of something that looks almost exactly the same from a geothermal field in Chile. It was a pretty compelling comparison. Then he went on to show that these environments on Earth are very conducive to life and that the little silica blobs preserve biosignatures well. So although it would be an interesting decision to invest another mission in the same location, that site was favored because it's the only place where a mineral that might contain signs of ancient life is known to exist with certainty. Do these two types of sites differ just in terms of their ancient environments? No. It turns out that you can see most of the deltas from Mars's orbit because they are pretty much the last gasp of processing of the martian surface. They date to a period about 3.6 billion years ago when the planet transitioned from a warm, wet period to basically being desiccated. Some of the hydrothermal sites may have rocks that are in the 4-billion-year-old range. That age difference may not sound like much, but in terms of an evolving planet that is dying, it raises interesting questions. If you want to allow the maximum amount of time for life to have evolved, maybe you choose a delta site. On the other hand, you might say, "Mars is dying at that point," and you want to try to get samples that include a record from an earlier, more equable period. Since the community is divided roughly evenly between these two types of sites, one of the important questions we will have to wrestle with until the next workshop (in early 2017) is, "Which of those kinds of sites is more promising?" We need to engage a bigger community to address this question. What happened to the list generated from this workshop? Over the course of the coming year, the Mars 2020 engineering team will continue its study of the feasibility of the highly ranked landing sites. At the same time, the science team will dig deeply into what is known about each site, seeking to identify the sites that are best suited to meet the mission's science goals. I expect that advocates for specific sites will also continue doing their homework to make the strongest possible case for their preferred site. And in 2017, we'll do the workshop all over again! Where should the European Mars rover land?